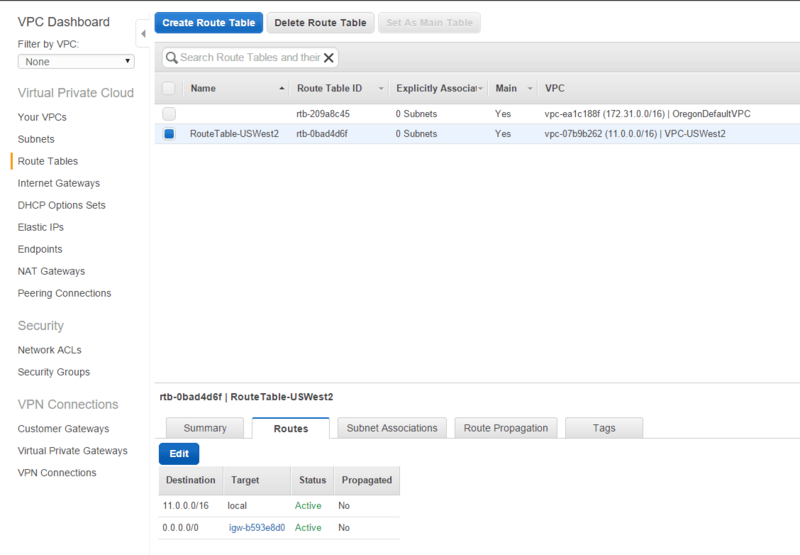 In previous articles, I’ve described how to set up WordPress in AWS using EC2 and RDS. In this article I’ll describe the steps I took to move the server between regions and get it working again – in my case from Sydney to Northern California. 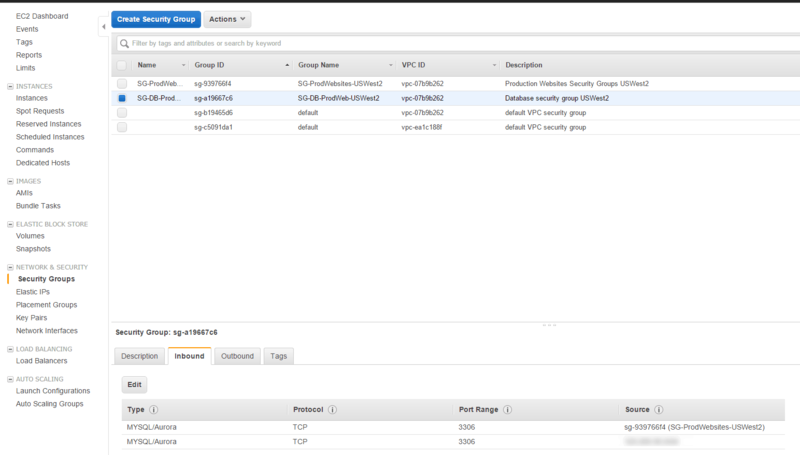 Stop your EC2 instance and create an image (EC2 -> Instance -> Actions -> Image -> Create Image). Wait until it’s done, when it is you’ll see it under “AMIs”. Start your AMI again if you want to avoid Elastic IP charges, or release your IP. Select the AMI, choose Actions -> Copy AMI. Choose your target region and click go. Go into RDS and create a new snapshot – you don’t have to stop it. Choose “Copy Snapshot” and choose your target region, click go. Wait for the AMI and snapshot to copy over – this could take minutes or hours. In my case an 8GB AMI seemed to take around 5 minutes – fairly impressive speed. 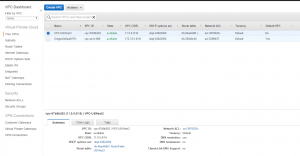 Create a VPC, I used the CIDR 11.0.0.0/24. This created a route table for me. 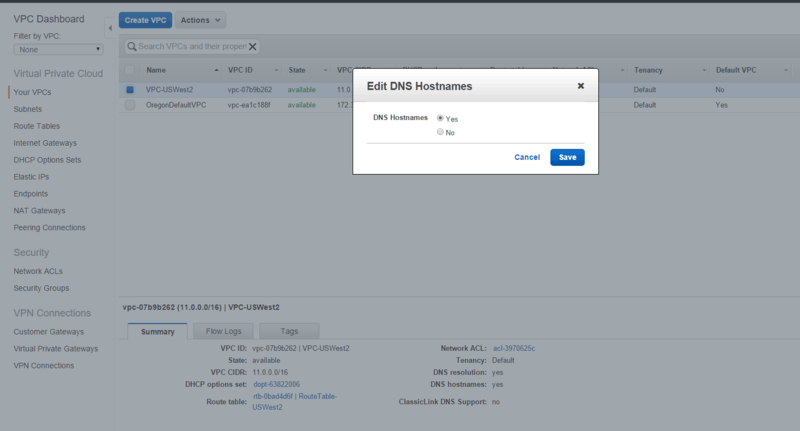 If you want your RDS instance to be publicly accessible select your VPC then choose Actions -> “Edit DNS Hostnames” and choose yes. Create an Internet Gateway, and attach it to my VPC. Add a new route with destination 0.0.0.0/0 to my new internet gateway. Create a new security group for my web server. I added inbound rules that allow http and https to 0.0.0.0/0 (anywhere) plus routes for SSH to my home and work IP addresses. My old VPC had TCP ports 1024-1048 open to the world as well, but I can’t remember why, so I’ll not put that back unless something doesn’t work. 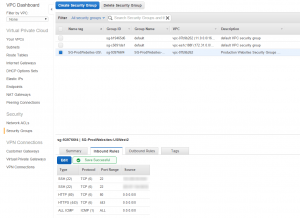 Create a new security group for my database server, in RDS. This simply allows access on port 3306 from the website security group. Create a new subnet for my production web server, and another two for my production RDS database server (RDS requires two subnets in two AZs). I used CIDR’s 11.0.1.0/24 for web and then 11.0.2.0/24 and 11.0.3.0/24 for DB. The route table was set up for me automatically. 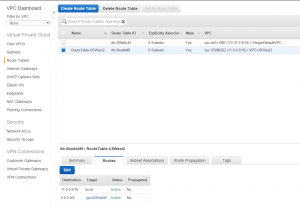 In your route table for the VPC go into subnet associations. Hit edit, and add both your website and database subnets. 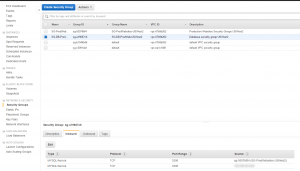 Go to the AMI screen, select the AMI you copied from another region, and go through the process to create a new EC2 instance. Make sure to select the VPC and subnets you previously set up. Make sure you download your new private key, then use puttygen to convert it from pem to ppj format (SSH2 RSA). Details on this AWS page. 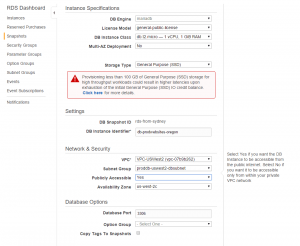 Allocate a new Elastic IP and associate it with your instance. Log in using Putty and your new private key. Set up a DB Subnet Group. 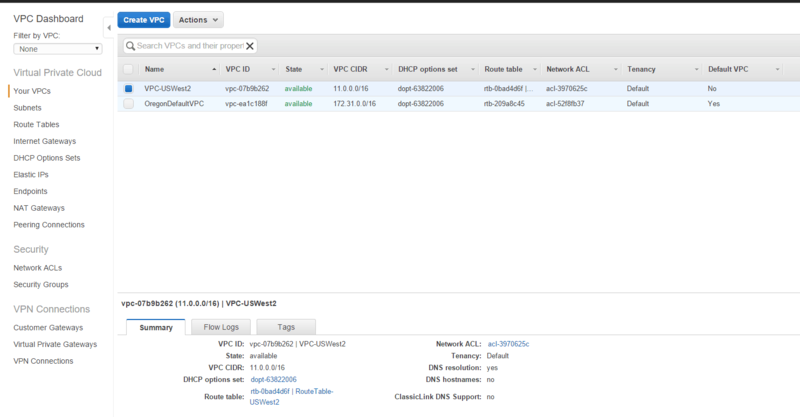 Make sure to select the VPC you created, in the same AZ as your web server, to minimize latency. You have to add two subnets, each in a different AZ, but you don’t have to use both. Go to the RDS Snapshots screen and choose “Restore Snapshot”. 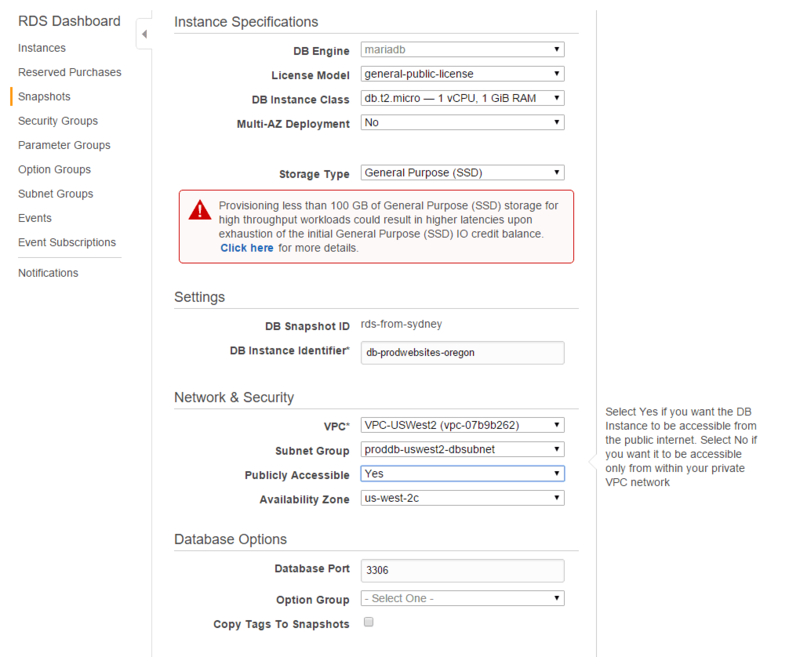 Make sure to choose a db.t2.micro, single AZ deployment. 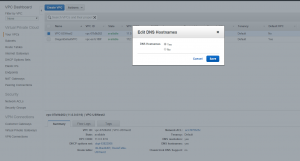 You can choose to make your RDS instance publicly accessible if you want to – I find this useful as then I can use proper visual database tools rather than just the command line. You can of course restrict access using security groups or network ACLs. Grab your endpoint URL and copy it to anywhere that needs a database connection. Redo your database grants, as your IP addresses and such will have changed. 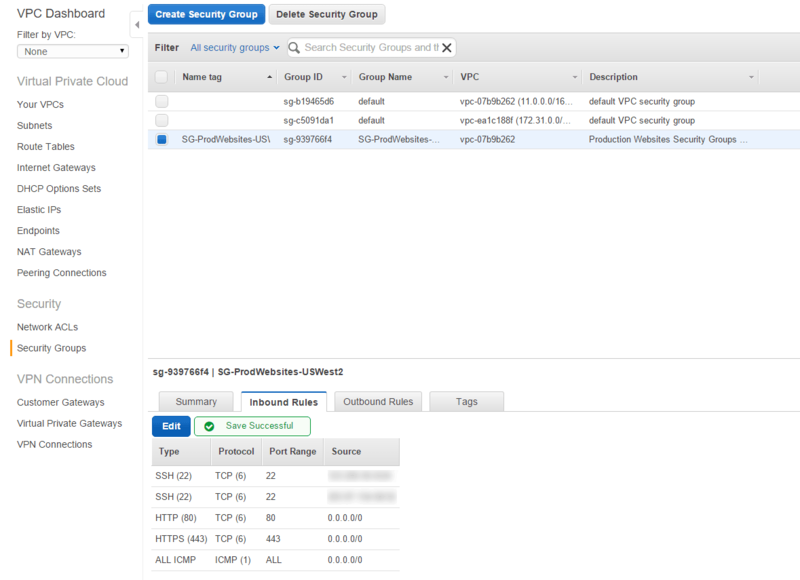 I had put the RDS instance into the wrong security group, so I spent a little time tracking that down. The key was telnetting from EC2 to RDS to test connectivity: telnet (rds endpoint) 3306. I’d forgotten to redo the grants. That’s it. All in all it was fairly simple, even with the little problems it only took me a couple of hours. These screenshots may be helpful, giving additional details. Click on the thumbnails to enlarge them.